This entry was posted in Managing risks & hazards on 2018/05/16 by Susan. Flood waters move fast. Flood season is a hazardous time of year if you drive on resource roads to get to work. It’s important to make sure you’re prepared. It’s flood season in B.C. As I write this post, the waters are rising in many places throughout our province. Almost 3,000 residents remain out of their homes, including those who live on about 400 properties in Grand Forks, according to this story from Global News, B.C. flooding map 2018: A look at the flooding areas around the province. If you recall, last year’s flood season was especially tragic: a fire chief drowned when he was swept away by high water while monitoring water levels during flood season. You may already have a household plan for flooding, but are you prepared for working in or near a flood zone? Even if your worksite is not directly in a flood watch or warning zone, workers and employers need to consider many factors when working outside of urban environments during times of seasonal flooding. This is especially true if you travel through the backwoods or rely on resource roads to access the worksite. Lisa encourages employers to review travel routes and think of alternatives. If the risk is high, even consider changing work locations or modes of transport. Be prepared with emergency supplies and provisions in case you’re stuck behind a flood or road washout. Driving through water is dangerous – vehicles can be washed away in as little as a foot of water, and that should be avoided. 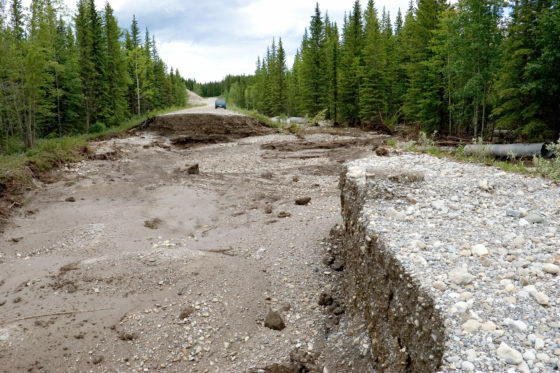 Do you have any experiences driving or working in flood or washout zones?